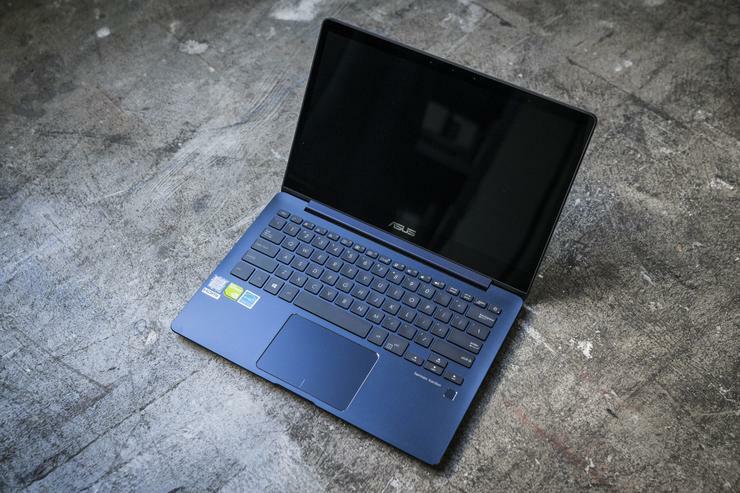 Yes, you can scoop up a faster 8th-generation Intel quad-core ultraportable than the $1,000 Asus ZenBook 13, but good luck finding one with a discrete graphics core, perfect for Photoshop-minded professionals or casual gamers craving on-the-go Fortnite or Dota 2. A solid array of ports, a snappy keyboard and impressive battery life round out the enticing (if fingerprint-prone) package. We tested the $1,000 royal-blue version of the ZenBook 13, which comes with a 13.3-inch touch display, an 8th-generation quad-core Intel Core i5-8250U processor, discrete Nvidia GeForce MX150 graphics, 8GB of RAM, and a 256GB solid-state drive. 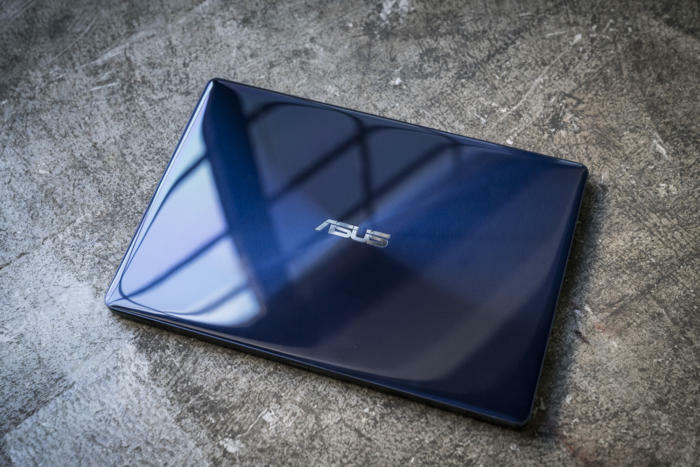 A cheaper version of the ZenBook 13 with integrated graphics might be on tap in “a couple months,” according to an Asus rep. The ”nanoimprint lithography” on the ZenBook’s lid is both gorgeous and fingerprint-prone. The shiny result is certainly a sight to behold, never more so than when you first glimpse the pristine ZenBook sitting in its cardboard shipping box. Within a few days, though, the lid of my ZenBook 13 review unit was covered with fingerprints. I was able to buff the shiny finish back into shape, but fighting off the smudges turned out to be a losing battle. Measuring 12.2 by 8.5 by 0.5 inches, the ZenBook 13 makes for an impressively slim machine given its discrete graphics core, and it feels reasonably light at about 2.7 pounds, or a little over three pounds if you include the seven-ounce power adapter. The ZenBook’s 13.3-inch 1920-by-1080 display looks sharp and vivid, with svelte 6.9mm bezels along the sides but somewhat thickers bezels along the screen’s top and bottom edges. Measuring about 282 nits (or candelas) at its highest brightness setting, the ZenBook 13’s display is reasonably bright, well above our minimum 250-nit standard for comfortable indoor viewing, if a tad dimmer than the 300-nit readings we’ve recorded on competing laptops. 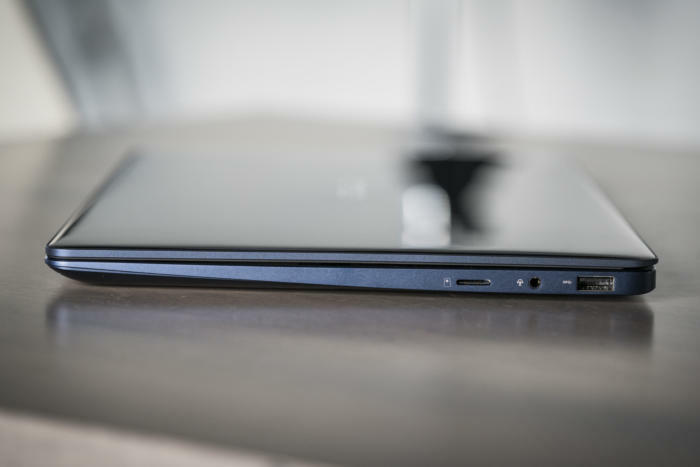 Viewing angles on the ZenBook 13’s AHVA (a proprietary twist on IPS) screen were excellent, with the display dimming only slightly as I moved from side to side or above and below. The ZenBook’s touch-enabled display easily handled my taps and swipes, and yes, there’s pen support, although you’ll have to pony up $50 for the optional ASUS active pen. I’m a big fan of the ZenBook’s 13 snappy keyboard. The Zenbook’s backlit, slightly concave keys boast a solid, pleasingly bumpy feel when stuck, while the roomy keyboard makes it easy for fingertips to find the right keys while touch typing. The hotkey selection is fairly typical, including the usual hotkeys for brightness, volume, airplane mode, toggling the trackpad and juggling external monitors. The keys on the ZenBook 13’s backlit keyboard boast a snappy, tactile bump when struck. The ZenBook 13’s midsize trackpad felt smooth and responsive, although it requires quite a bit of pressure to click. To the right of the trackpad sits a fingerprint reader, which lets you unlock your Windows profile and log into select Windows Hello-enabled apps and services. Personally, I found the ZenBook’s fingerprint sensor to be a bit touchy. The reader rarely recognized my fingerprint on the first try, even after I deleted my initial fingerprint and carefully scanned a new one. 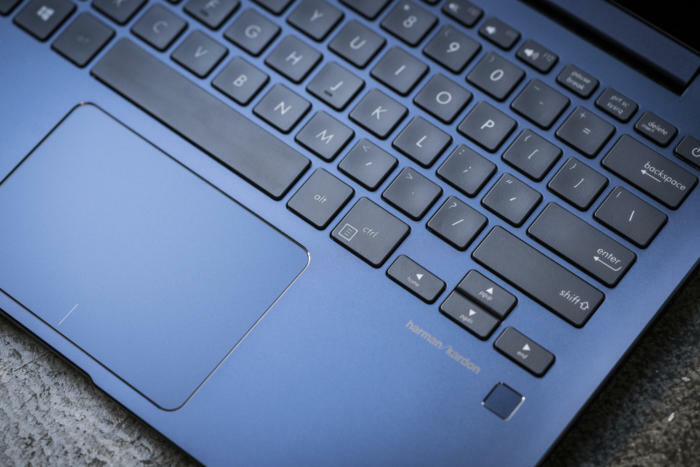 The ZenBook’s Harman Kardon-made speakers are a cut above your average laptop speakers, although thery’re no substitute, unsurprisingly, for external speakers. “Live and Let Die” by Paul McCartney and Wings sounded crisp and detailed, even with the volume cranked, while Mozart’s 27th symphony offered up an impressive amount of mid-range refinement, although little in the way of bass (again, no big shock). While the ZenBook 13’s speakers are above average, its VGA webcam is disappointingly sub-par, delivering muddy and grainy video quality that barely suffices for video chat. The ZenBook 13 boasts a solid selection of ports, starting on the left side with a full-size HDMI port, a USB 3.0 Type A port, and USB 3.1 Gen 1 Type C (up to 5Gbps). Also on the left: a barrel-style charging port. 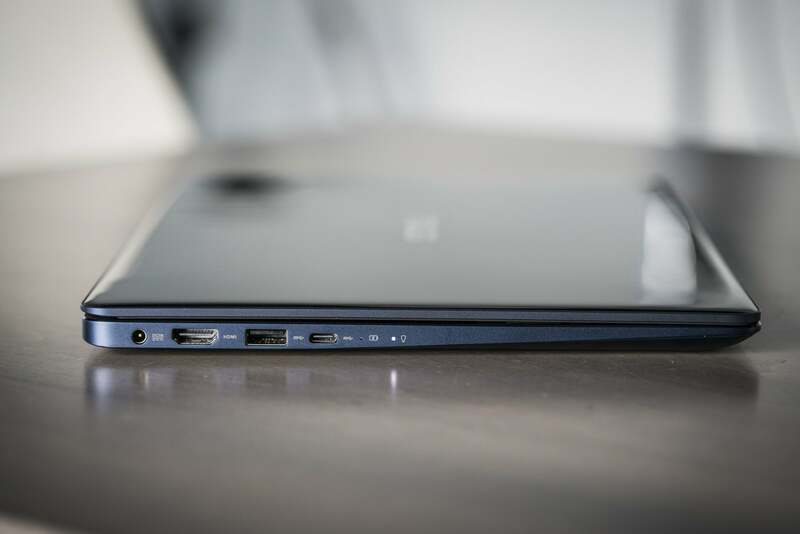 Left-side ports on the ZenBook 13 include a full-size HDMI port, USB 3.0 Type A and USB 3.1 Gen 1 Type C.
On the right, you’ll find a second USB 3.0 Type A port, a Micro SD memory card reader, and a combo audio jack. A second USB 3.0 Type A port, a combo audio jack and a Micro SD card reader round out the ZenBook’s array of ports. Nope, no Thunderbolt 3, but that’s not a big shock given the ZenBook’s middling price point. While it’s not the fastest 8th-generation quad-core Intel laptop we’ve tested, the ZenBook 13 keeps pace with the competition and closes the deal with solid battery life and a discrete GPU, a rarity in an ultrabook this thin and cheap. As with most of its 8th-generation Intel-powered competitors, the ZenBook 13 breezes through everyday computing tasks. The ZenBook 13 got a solid PCMark 8 Work Conventional score, but that’s par for the course. 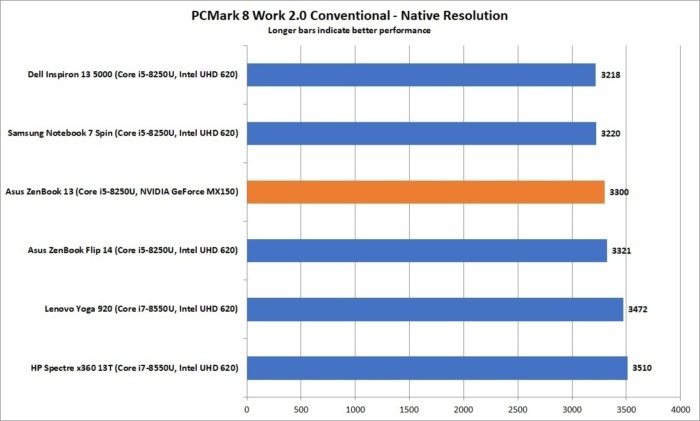 In our PCMark 8 Work Conventional benchmark, which simulates web browsing, video chatting, spreadsheet building, and other day-to-day PC duties, the quad-core ZenBook notched a score well above 2,000, our minimum standard for smooth Office performance. 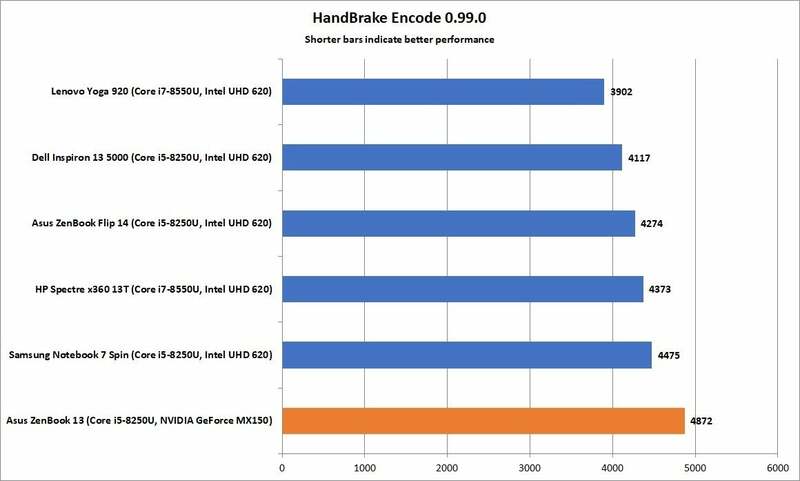 Not bad, but keep in mind that cheaper dual-core systems often deliver similar PCMark 8 results, meaning those looking to perform only basic computing tasks are probably wasting their money on a pricier quad-core laptop. A much better test of quad-core performance, our Handbrake benchmark measures how well a system handles the CPU-intensive task of encoding large video files. We’ve seen better Handbrake results from 8th-generation quad-core ultraportables, but the ZenBook 13’s score is still in the ballpark. While the ZenBook 13’s score of 4,872 seconds trails its closest competitors, it’s still in the ballpark (albeit near the warning track) in terms of what we’d expect from a quad-core ultraportable in the $1,000 range, and its Handbrake performance easily outshines cheaper dual-core systems, which regularly take 6,000 seconds or more to complete our Handbrake test. Sprinting from last to the front of the pack, the ZenBook 13 surges in our Cinebench benchmark, which tests CPU performance under the crushing load of rendering a 3D image. In our multi-core Cinebench test, the ZenBook lags the leader (the Dell Inspiron 13 two-in-one) by a mere point, leaving its other quad-core 8th-gen competitors well behind. The ZenBook 13’s impressive Cinebench score proves it’s capable of short bursts of speed. Why the difference? 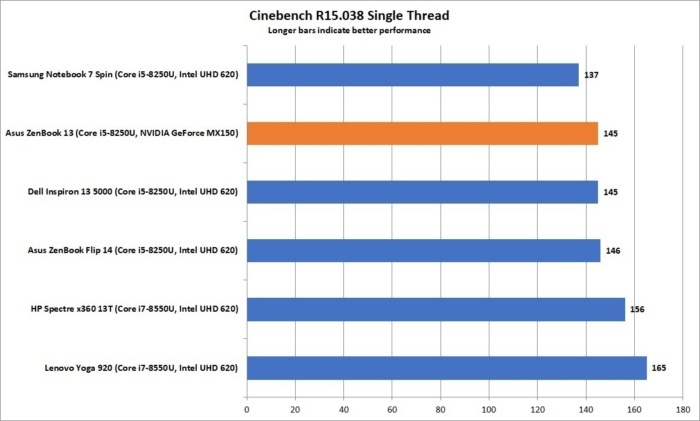 Well, let’s consider the fact that the Cinebench test, which takes only about five minutes to perform, is like the 100-yard dash, while the hour-plus Handbrake benchmark is more like the 10,000 meters. It’s likely the ZenBook 13 can sprint short distances but prefers to pace itself for longer hauls, all in the interest of keeping everything cool inside the system’s svelte chassis. 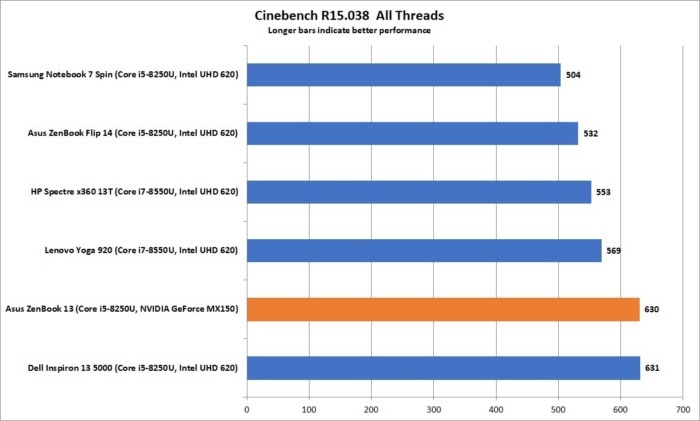 The ZenBook’s single-core Cinebench result is similar to other notebooks in its class. Meanwhile, the ZenBook 13’s single-core Cinebench mark score is pretty much in the middle of the pack, as we’d expect, and similar to what you might see from a cheaper dual-core system. Before we get too excited about the ZenBook 13’s 3DMark Sky Diver score, keep in mind that our comparison chart pits it against 8th-gen quad-core systems with integrated graphics cores. 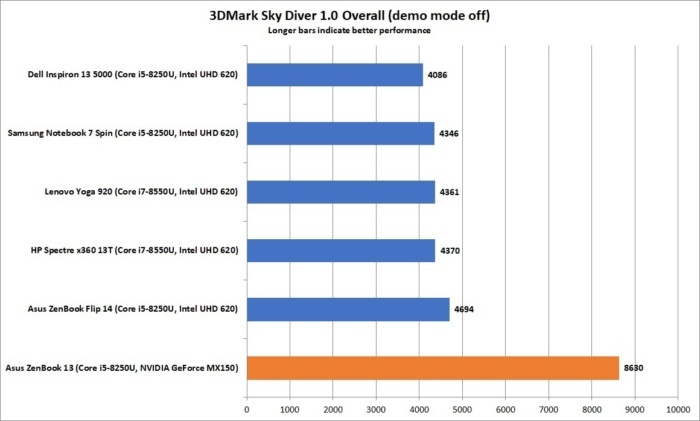 Naturally, the Sky Diver results for the ZenBook and its discrete Nvidia GeForce MX150 GPU will crush those of any competing laptop that settles for integrated graphics. Thanks to its discrete GeForce MX150 graphics core, the ZenBook 13’s Sky Diver score blows away those of competing laptops with integrated graphics. But the entry-level MX150 was never intended to compete with, say, the GeForce GTX 1080, the 4K-capable graphics core that sits in the $2,300 Alienware 17, our favorite gaming laptop. Instead, the Pascal-based MX150 is more suited for Adobe Premiere and Photoshop chores, or light 720p gaming and e-sports. Think Dota 2 or Fortnite (which I played at 60 frames per second on medium settings), rather than Battlefield 1 with all its graphical bells and whistles enabled. It should also be said that the ZenBook 13’s Sky Diver score (8,630) is somewhat lower than that of the Acer Aspire E 15 (11,526), another GeForce MX150-powered budget laptop. Then again, if you want to choose the Acer Aspire E 15 over the ZenBook 13 based on its higher Sky Diver score, you’ll have to settle for a laptop that’s twice as heavy and twice as thick. 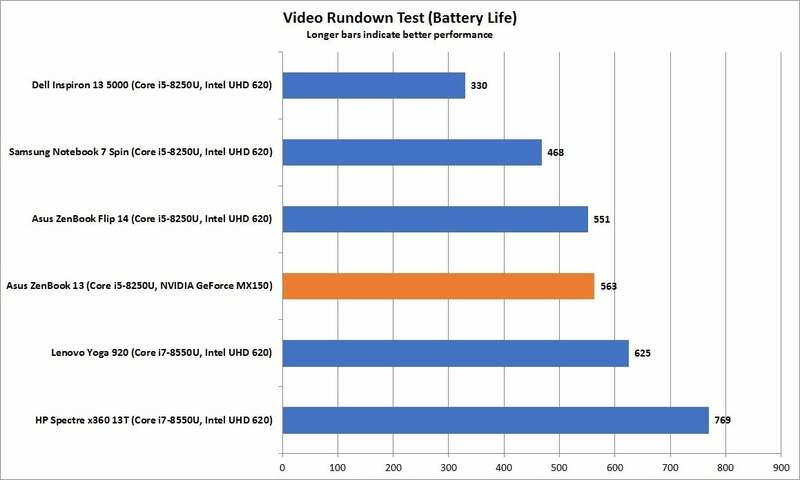 We test laptop battery life by looping a 4K video using the stock Windows video player, with screen brightness tuned to about 250 nits (which, in the ZenBook 13’s case, means turning the brightness setting up to 95 percent) while dialing the volume halfway, with headphones plugged in. The ZenBook 13’s result is pretty good, squeezing out a solid nine hours-plus from its 50Whr battery. That’s within spitting distance of the Lenovo Yoga 920 and its much bigger 70Whr battery, if well shy of the HP Spectre x360’s nearly 13 hours of battery life from its 61Whr battery. Either way, if you’re heading out for the day with the ZenBook 13 in your knapsack, you’re probably safe leaving the AC adapter at home, a big plus in our book.